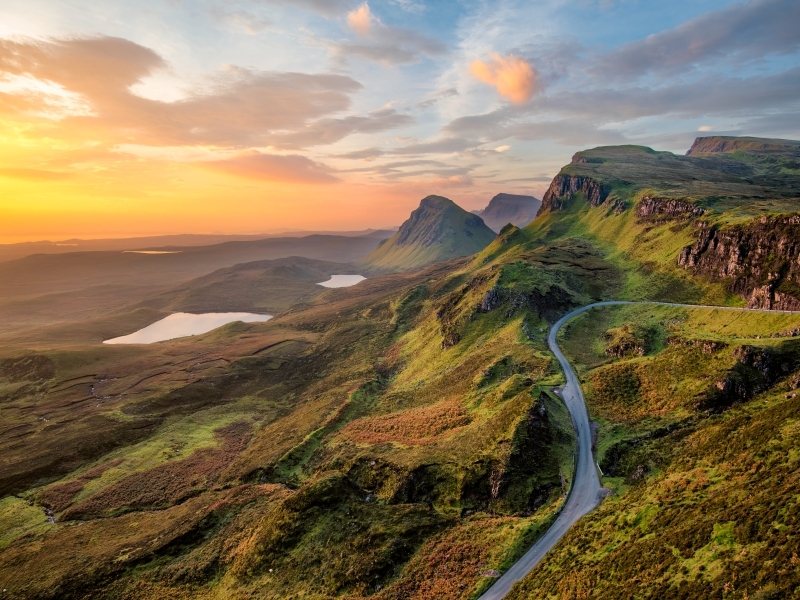 From the stunning ‘Road to the Isles’ and legendary Loch Ness, to the mysterious Black Isle, this holiday features a host of Highland highlights. Enjoy a ride on the delightful Strathspey Steam Railway and take a cruise on the Moray Firth, home to around 190 resident bottlenose dolphins and a wealth of birdlife. In the company of our friendly, knowledgeable Tour Manager, unveil the beauty and variety that this very special part of the world has to offer. Fly to Inverness, meet your Tour Manager and make the short transfer to Carrbridge. Depending on your arrival time, spend the rest of the day enjoying the delights of this pretty village. Opposite your hotel, you’ll spy famous Packhorse Bridge, which dates back to 1717 and is reputed to be one of the oldest bridges in Scotland. This morning it’s off to the rose-coloured, turreted Brodie Castle (entrance payable locally but free to National Trust members), the ancestral home of the Brodie clan for over 400 years and a treasure trove of priceless antiques and artefacts. The castle building ranges in style from the impenetrable 16th guard chamber to a sprawling Victorian extension with some magnificent rooms. The guided tour will help you make the very most of your visit. The beautiful grounds are also well worth exploring. Later in the day you’ll have the chance to see some of the Moray Coast and to explore the fine, historic town of Elgin with its warren of alleys and closes and awe-inspiring cathedral ruins. Explore the capital of the Highlands today as we visit Inverness, home to a delightful Victorian Market, an excellent museum and art gallery, and attractive riverside walks. We’ll also enjoy a short tour of the Black Isle, which, contrary to its name, is neither black nor an island, but rather an isolated peninsula surrounded by three bodies of water. We’ll stop at Fortrose, which overlooks the Moray Firth, as well as the charming nautical town of Cromarty. The day ends as you board the Dolphin Spirit for a cruise around the inner Moray Firth, where hopefully you’ll spot the resident bottlenose dolphins gliding through the waters. Today we visit beautiful, mysterious Loch Ness. We’ll head to Fort Augustus, at the southern tip of the loch, where the Caledonian Canal Heritage Centre gives a fascinating insight into the history and operation of the canal. From here, we’ll continue past the dramatic ruins of Urquhart Castle to Drumnadrochit, where you may like to visit the Loch Ness Exhibition Centre or perhaps enjoy a boat trip to go monster hunting. Nature lovers are in for a treat as the wooded shores of the Loch are home to an abundance of wildlife, including cormorants and ospreys. We’re treated to a ride on the nostalgic Strathspey Steam Railway through the Cairngorm National Park, home to five of Scotland’s six highest mountains. Enjoy the ride as the vintage train skirts the course of the River Spey, past heather fields, moors and forests. We head west today, following the evocatively named ‘Road to the Isles’ from Fort William to Mallaig. On this wonderfully scenic day we’ll pass through diverse landscapes ranging from sandy beaches to flowering heather moors and dense woodlands. Our first stop will be at the Glenfinnan Visitor Centre, from where you can see the eponymous monument built overlooking Loch Shiel. Take the short uphill walk from the centre to get a wonderful view of the famous Glenfinnan Viaduct. The road ends at the thriving fish port of Mallaig, home to an excellent Heritage Centre. Make sure to try some of the delicious kippers while you’re here, thought to be some of the tastiest in the country.